My edition: Paperback, to be published on 10 April 2014 by Penguin, 384 pages. Description: Rachel is looking for her beautiful day. She's worried about everything: being a good mother, money and starting a new job. Philip is a lost soul in the world and he could do with a friend. They are just about to meet and when they do everything will change. Rachel and Philip don't know it yet, but they each have what the other needs. They can save one another, and not in the way you might expect. This is a story about finding happiness and love in all their forms. And how sometimes you can find them in the most unlikely of places. This is a stunning novel and I am not just talking about the strikingly beautiful cover. I expected it to be heavily focused on a romance storyline, but instead it's a much more raw and honest look at the purest form of human connections and some of the very heart-breaking flaws that seep into the British care system, despite so many people working tirelessly and in an almost inconceivably selfless way to try and make a difference. As readers we become acquainted with Clifton Avenue care home through the eyes of Rachel. She is a single mum of three in desperate need of a job to support her family and more by accident than on purpose she ends up working in the care system. It turns out to be the perfect environment for her to not only do some much-needed good for the people who live there and need her help, but also to blossom as a person and mother herself. Her intense role as a carer inevitably influences her personal life and unexpectedly provides exactly that what had been missing since her relationship with her ex-husband fell apart. She'd been just as lost as some of her patients and throughout the novel they help her as much as she helps them. While Rachel joins Clifton Avenue as a carer, at the same time Philip arrives as a new resident. He's an incredibly confused and vulnerable person with little means of communication, making it difficult for anyone to get through to him. They know he is distraught by the death of his mother, his sole caretaker for the thirty plus years he's been alive, and that he's never been to school or outside of the family home really. So after losing not only his mother but also the only environment he's ever known, he's very withdrawn when Rachel is assigned to be his key worker. What follows is simultaneously an incredibly difficult but also a beautiful and rewarding process as Rachel patiently and painstakingly tries to win Philip's trust so he will allow her help him. I was in awe by her endless patience and kindness as I don't think I would've been able to stay as gentle and focused in a similar situation. This novel has not only opened my eyes about the difficulties faced by those trying to make a difference in the care system, but has also given me a huge admiration for these amazing human beings who work so hard and lovingly to take care of someone else. 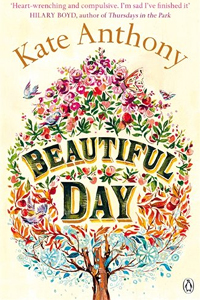 Kate Anthony has written a beautiful, thoughtful, poignant and heart-warming read, one which tells an incredibly important story. I'm astonished that this is her debut novel as it is eloquent, complex and tackles difficult issues in a sensitive way. It's also one of those rare novels that will make you want to be a better person yourself. Because if Rachel - who suffers so much hardship in a short space of time in her personal life - can remain endlessly imperturbable, gentle and self-sacrificing for her patients, then we really have no excuse to not reach out to someone else as well and try to make their world a little brighter and better. Many thanks to Real Readers for an advance copy of the novel in exchange for an honest review.